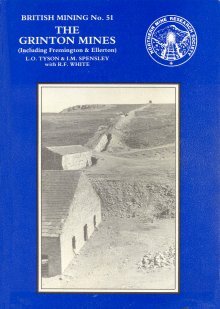 This is the first detailed history of mining and smelting in Grinton, Ellerton and Fremington. The Crown owned the minerals at Grinton until 1877, but was never directly involved in the mining. Instead, this was done by lessees, some of whom also mined in Ellerton and Fremington. Although mining in this area peaked in the 18th century, lead was still being produced there in the 1890s. The monograph has a section on the consolidation and arch�ological work at the How smelt mill.